Shades of Chaos is getting prepped for the New Year and celebrating the one that was 2018 with a special giveaway. 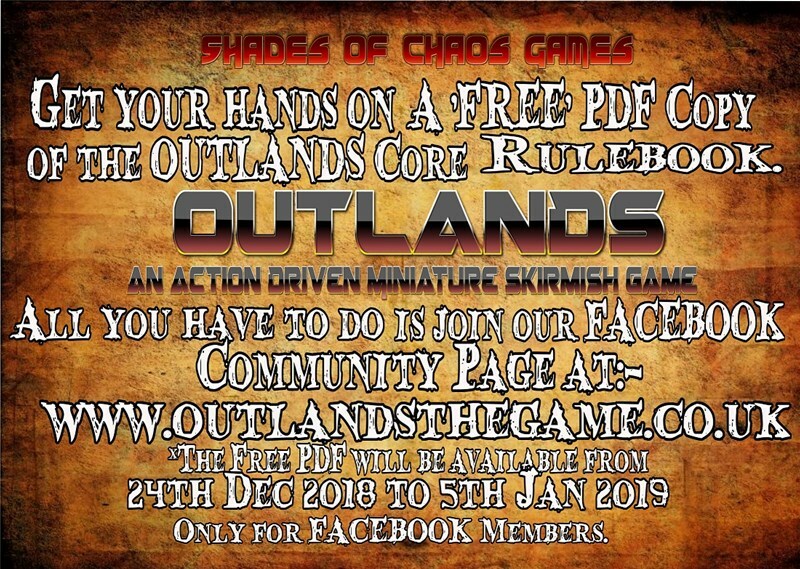 Folks that sign up for their Facebook group will be able to get themselves a free copy of their Outlands rulebook pdf from the 24th of December until the 5th of January. 2018 was by far the most successful and busy year Shades Of Chaos Games has had since the release of OUTLANDS. To celebrate and usher in 2019 (going to be even more OUTLANDS content), we are giving a FREE PDF of the OUTLANDS Core Rulebook via our Facebook page. To get your hands on the Free OUTLANDS Rulebook (normal RRP £4.50) is join our Facebook Community (www.outlandsthegame.co.uk direct link). The Free OUTLANDS PDF will be made available from 24th Dec 2018 to 5th Jan 2019.